I posted a test image to Adobe Stock (internal link) twice by accident. It was subsequently rejected by two different moderators for two different reasons. The first moderator said the image had too much noise. Too grainy. That’s understandable because the photo was taken with a long telephoto lens. Commercial products (e.g., toys, fashion items, electronic devices and designer furniture) should never be in focus and/or be the main subject of the content if they’re identifiable and distinctive in visual appearance, like shape or color. I submitted the photo just as an experiment. I wasn’t really happy with it because there was no blue sky that day but I wanted to go through Adobe Stock’s process. Now that I have, I have more questions. I don’t know how you can have a men at work photograph without showing the equipment they are working on. Clearly there are no names or trademarks visible. I’ll see if there is a way to ask questions and if I get a response I’ll update this page. Click on the photo for a larger version. This isn’t the full version which is much too big for the web. I think it’s a pretty dramatic shot, despite the overcast sky. 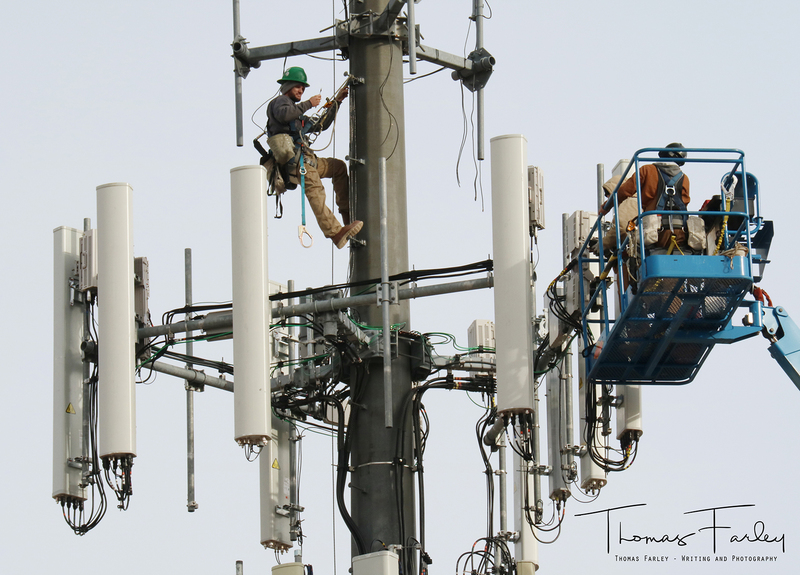 This entry was posted in Photography, Uncategorized and tagged Adobe Stock, cell towers, men at work photos, monopole, Photography. Bookmark the permalink.